This is the second post for the Just Science week (Feb 5th-9th). The resolution and coverage of both sea-floor mapping and subsurface seismic-reflection technology has grown by leaps and bounds over the last couple of decades. The above image is a perspective image of the Los Angeles, California area onshore topography and offshore bathymetry. Note the relatively flat continental shelf (green), very defined shelf edge, and variably steep continental slope leading to the deep sea (dark purple). The shelf edge and shelf is incised by submarine canyons that deliver terrigenous (i.e., derived from continent) sediment to the deep ocean. Many of these canyons and channels are sitting out at the shelf edge and are inactive now. During Last Glacial Maximum (~18,000 years ago) sea levels were much lower and the shoreline was essentially at the shelf edge. Some of these canyons are still active at present, however. On Friday of this week I will have a post about research I’ve been doing recently studying the flux of terrigenous sediment to one of these basins. This next image (above) is a map-view of the bathymetry offshore of Monterey, California (please check out MBARI‘s website for more great images of the sea floor). Monterey Bay is in the upper right of the image with the head of Monterey submarine canyon smack-dab in the middle between Santa Cruz to the north and the town of Monterey to the south. Monterey Canyon is a huge feature…follow it out seaward and the canyon transitions into a submarine channel with a beautiful meander that’s barely on this image. The distance from the canyon head to that meander, called Shepherd Meander, is approximately 125 km (75 mi) to give you a sense of scale. The water depth at that meander is approximately 3400 m (11,150 ft). 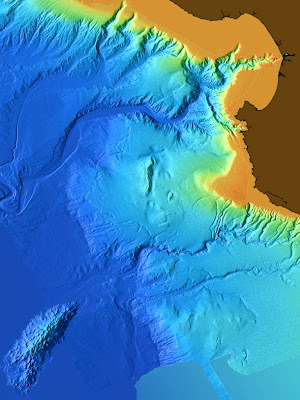 Monterey Canyon is one of the most studied and well monitored submarine canyons in the world. Turbulent gravity-driven flows carrying a lot of sand are responsible for carving out this fantastic feature over long time scales (hundreds of thousands to millions of years). 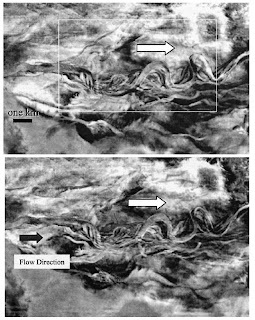 This paper from 2004 by colleagues of mine, Andrea Fildani and Bill Normark, is a great resource for understanding the geologic history and sedimentary processes related to the formation of Monterey Canyon. Three-dimensional seismic-reflection technology allows us to create maps of buried geomorphic features. The images shown at right and below clearly show beautiful meandering channels that were once on the sea floor (in very deep water) and are now in the subsurface. By analyzing ‘slices’ within the seismic volume we can map the evolution of the geomorphology through time. These images from a recent paper from Posamentier & Kolla (2003).